Sometimes, when you take ibuprofen, it’s for a specific pain point in your body: a headache, a sore hip, whatever. 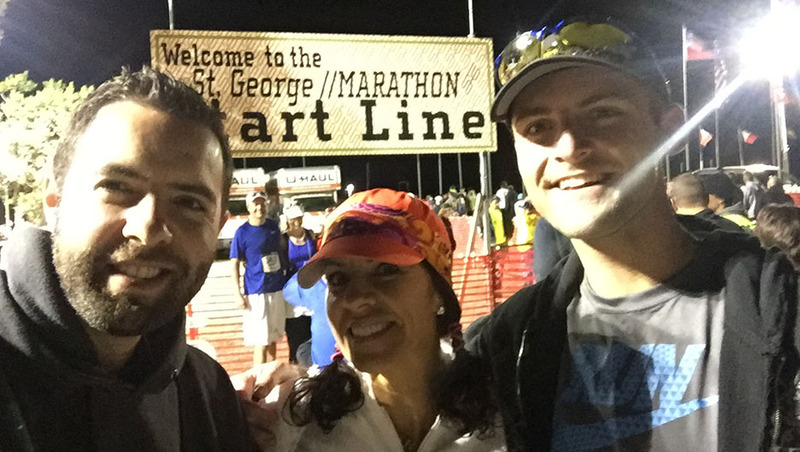 When I popped a pill at mile #18 of the 2015 St. George, Utah marathon, I told that little thing: “Pick a muscle, any muscle.” I was dying, everywhere. But 8 miles later, I finished my 9th full marathon and even achieved my target finish time. I’m definitely a little out of my mind. With all these travels in recent weeks, do you think I’ve had time to train for a marathon? Not even close. A few miles here and there in the evenings, and that’s it. As a matter of fact, the longest distance I’d run since the Wasatch Back Ragnar Relay in June was a measly 3 miles in one stretch. You can imagine my sense of apprehension when the shuttle bus dropped me off at the starting line for this race. Ready or not, I had a long way to go. But, as I’ve shared before, I compare a long-distance run to a long-distance drive: You just have to slice it up into manageable “chunks” and convince your brain that it’s achievable in small bites. So, in my case, I looked at the race as just running three miles. Over and over again. This year’s race was a family affair: Mom, stepmom, uncle, aunt, and cousin were all running it. The chances of (literally) running into ANY of them among 7,000 total runners was slim-to-none. 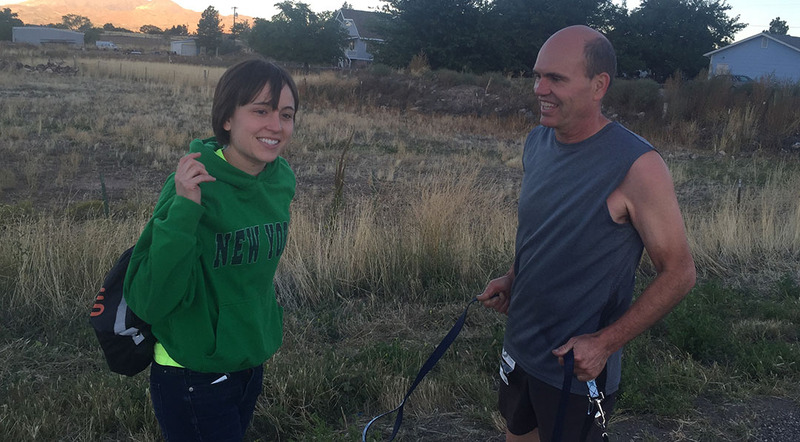 But right before the biggest hill in the 26-mile stretch, the dreaded “Veyo Hill,” I saw my uncle Jeff and we chatted it up. 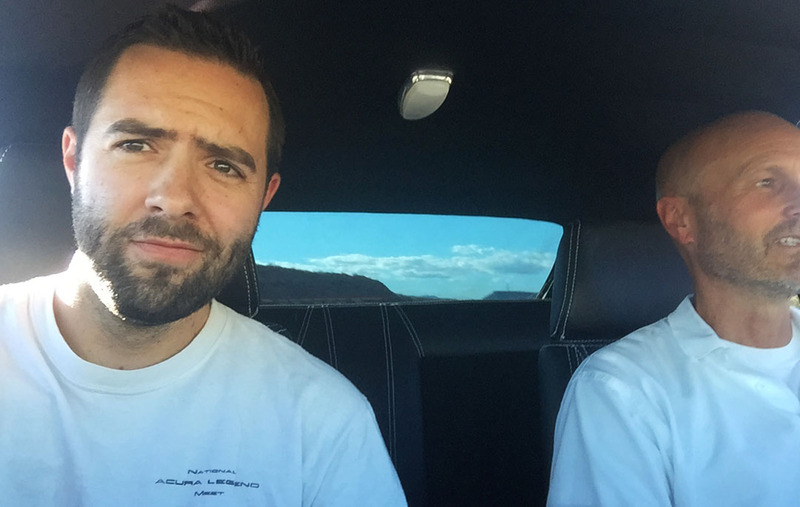 We had car talk for a few minutes, until I panted and said, “You have a better pace than I do; go on ahead!” and he left me in a cloud of dust. Meanwhile, mom was already miles ahead of me and I had a lot of time to meditate while pounding the pavement and listening to some thumpin’ music to keep me motivated. I downed a Five Hour Energy and a couple of “GU” energy gels along the way. And, of course, a few ibuprofen as already stated. Thank goodness for those. Around mile 24, Grandma was seated alongside the road in a camp chair at the same place where she always does. That was just the push that I needed to go those next couple of miles to the finish line. I also saw my dad, brother, sis-in-law, and niece/nephew spectating. And FINALLY – as the course rounded the corner to 200 South and headed east, I could see the Finish Line sign & balloons in the distance and gave a little extra push to have a strong completion to the race. Two chocolate milks chugged later, I was feeling better about the decision to give this whole thing yet another try. Gatorade & water cups all over the place! Sign on the roadside alerting runners: If you don’t get to “X” point by “X” time, you’re done! They have to open the road back up to traffic! My favorite part in the race – at about mile 15, when we skirted along Snow Canyon State Park on State Route 18. 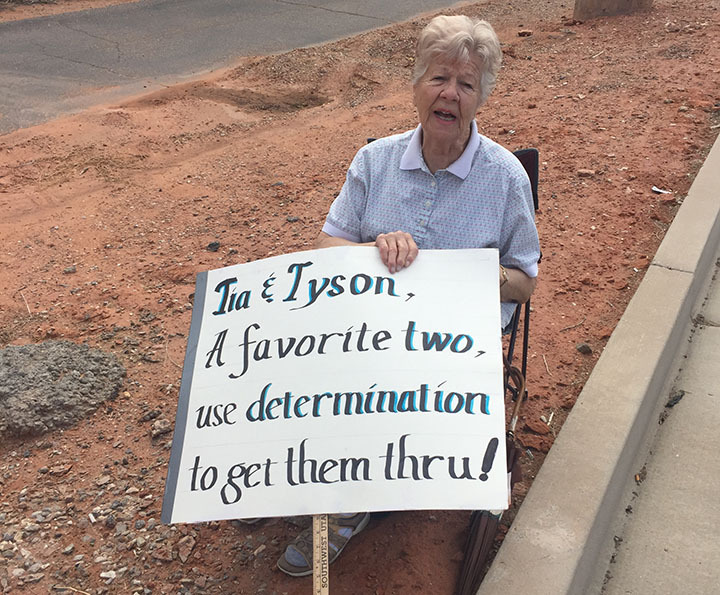 Grandma with her traditional sign! Thanks for your support, Doce! 3-year-old nephew, Beckam, totally airborne and running with me at an impressive sprint. My final standings – a 4:55 finish time in my age bracket is nothing to be proud of, but I was just glad to get in under the 5-hour mark. I thought it was interesting how my minutes-per-mile pace was a consistent 9:40 to start and then slipped to 10:31, 10:53, and finally 11:16. I was crawling! 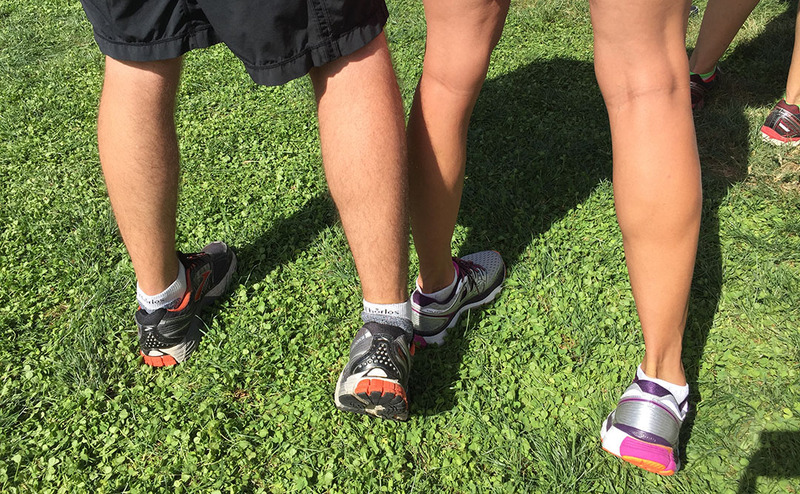 Clearly, my mom has better calves than I do. Speaking of legs: The first leg of my trip was that ho-hum 400-ish mile drive in the ILX that I’ve done so many times before. I got to my mom’s place around midnight. On Friday morning, we went to the marathon “Expo” where I had to retrieve my bib number, goodie bag, and a few supplies. Afterward, I stopped by my brother Bentley’s workplace to check out his latest project: a 1990 Ford F-350 4×4 dual cab, long-bed pickup truck that he restored as a “project truck” for my dad. If needed, I’m sure it could have monster-trucked (is that a verb?) 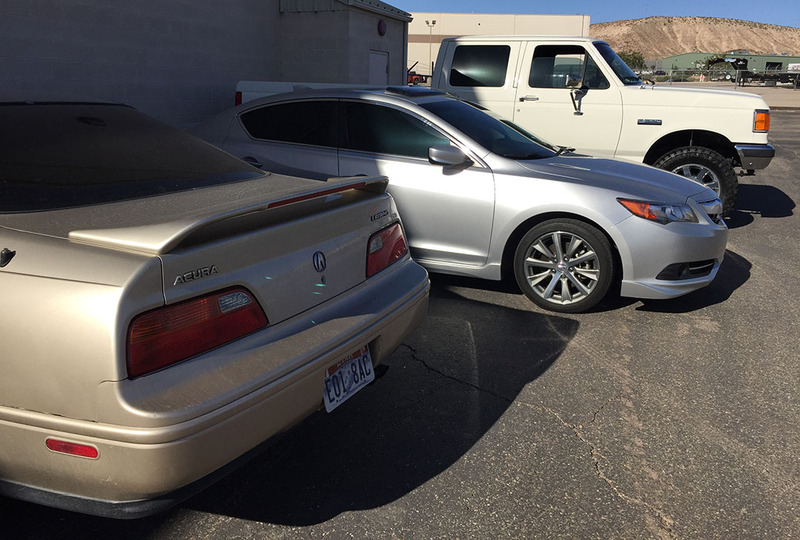 right over the top of the two Acuras sitting alongside it. 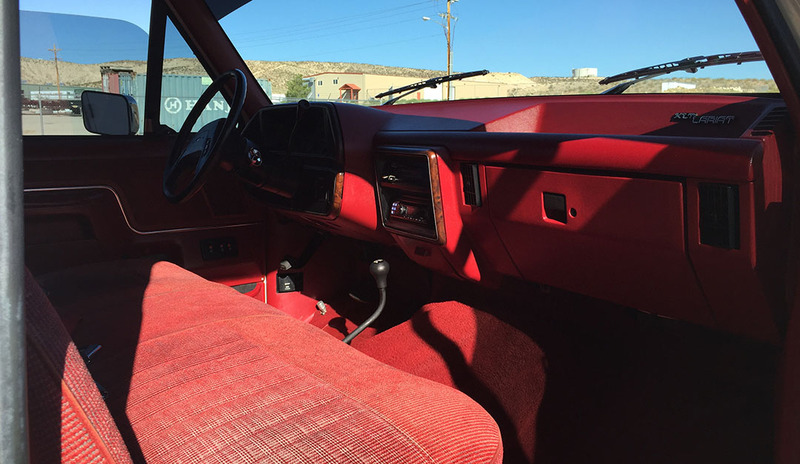 Let’s take a look at that interior. Twenty five years old! And still looking pretty fresh. That red color is eye-popping, but I love it. Don’t get carried away with the need for speed here. Note that A) The speedometer maxes out at 85 miles per hour, and B) the odometer only has 5 digits. This truck has 126,000 miles on it but shows only 26,000. Bentley went all-out on this rebuild, including a complete “undercoat” of the bottom of the truck in fresh black paint and some new shocks. Dad was thrilled about the pickup when he arrived! It rides pretty much as you’d expect it to – like an absolute tank. Speaking of tanks, let’s talk fuel economy. The truck has TWO fuel tanks, at what I believe are 16 gallons’ capacity each. Why so much fuel? It’s thirsty. Power for this rig comes from a 460-cubic-inch V8 motor. We’re talking fewer than 10 miles per gallon here. But as an around-town workhorse, it’ll sure beat my dad having to haul lumber out the back of his 2010 Hyundai Sonata (and yes, that really has happened). Another car in Bentley’s garage was begging to be taken for a walk around the block: This 1968 Chevy Nova SuperSport. It’s fully engine-swapped and mechanically updated from 1968 spec, but it’s a really REALLY fun car to drive. There’s nothing quite like the roar of a V8. Bentley demonstrated that when pulling it out of the garage for us. Watch until the end. 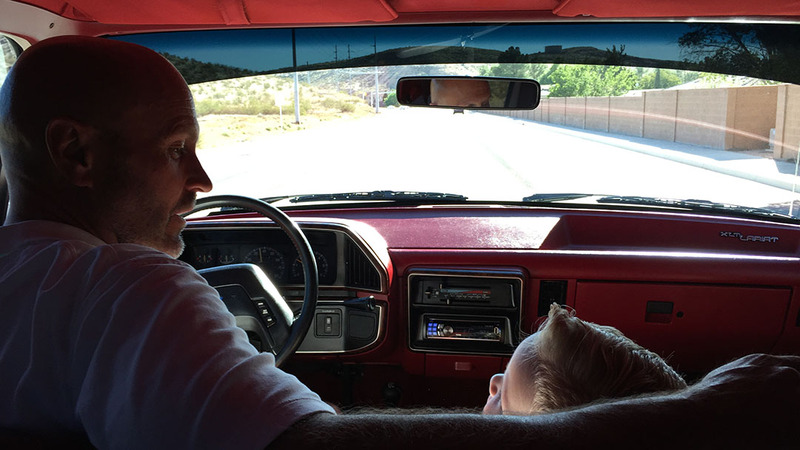 And with dad taking the wheel for a little bit. Chris M says I make this face too much. He’s right. ILX calling it a night out in front of mom’s house, as did I at an early hour. Pooped. I put a few miles on a family friend’s Porsche tonight. 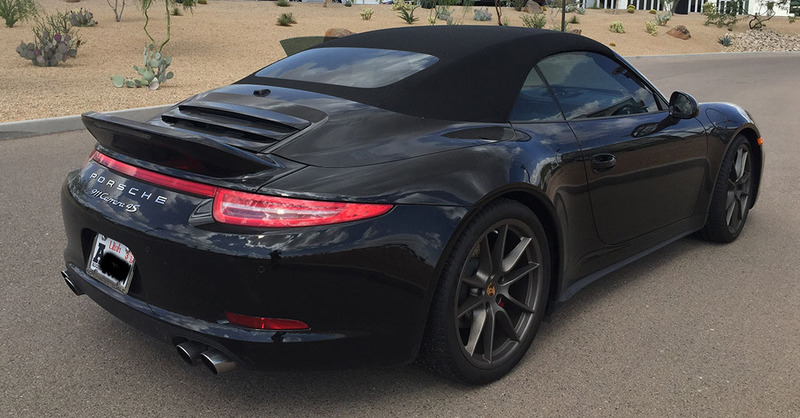 It’s a 911 Carrera “4S” model, and was a hoot to drive – minus its lack of a clutch pedal. 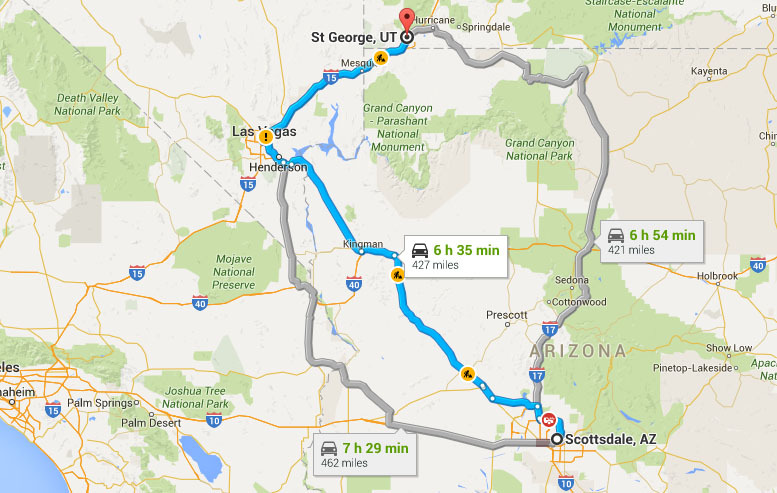 This entry was posted on October 4, 2015 at 4:04 pm and is filed under Road Trip, Running, Utah. You can follow any responses to this entry through the RSS 2.0 feed. You can leave a response, or trackback from your own site. Congrats on finishing your 9th full marathon! Next to cars, running is easily my greatest passion in life. Good times! Thanks for the congrats! Yeah, running is a bit addictive for sure. 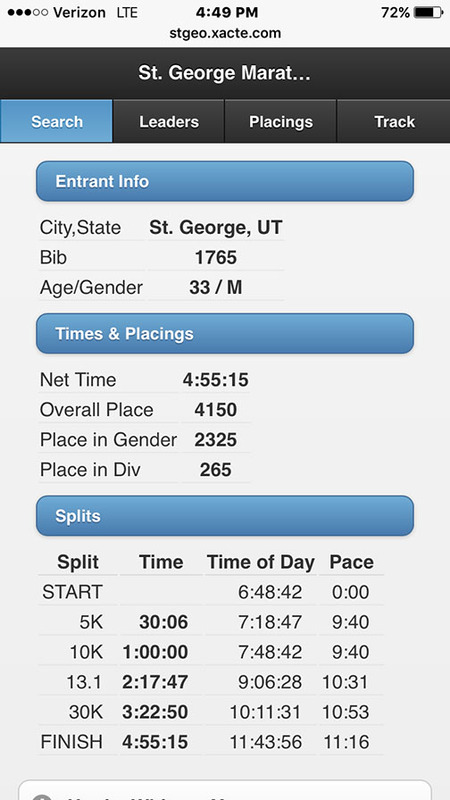 At this point I’m beyond the “gotta beat last year’s time” mode – I’m just glad to finish! But I’m already looking forward to my next competitive run: The Las Vegas Rock & Roll Half-Marathon in mid-November. It’s a unique race because it starts in the evening and runs on the Strip at night. Should be fun! It was a whirlwind weekend, especially for you just coming out of the prior big weekend in Texas. You continually amaze and impress me! 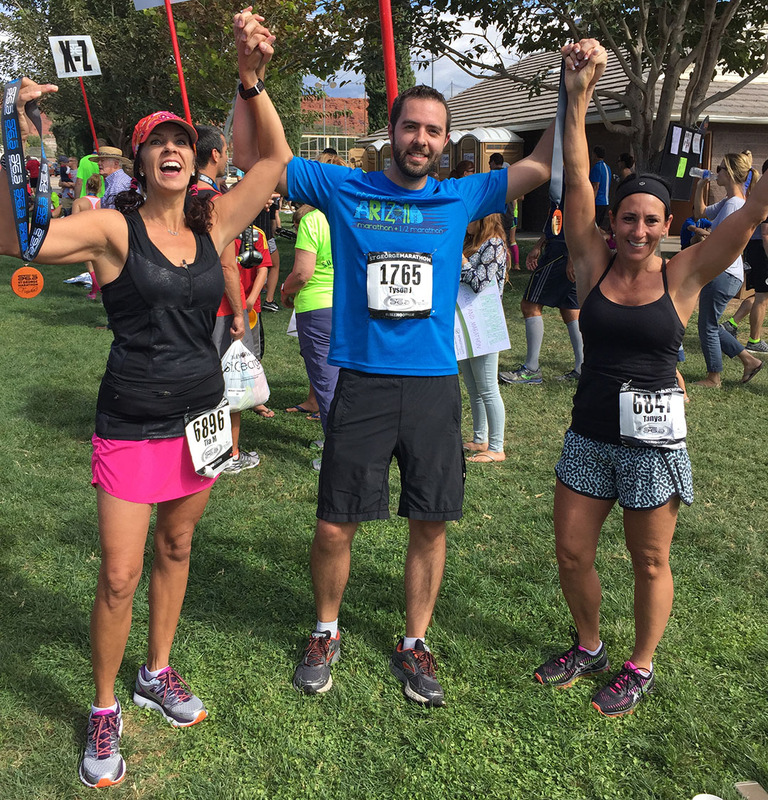 How do you train with a couple 3-milers and then pull off a marathon? Teach me. Haha. Maybe this marathon will count as all the training you need for next month’s half. Consolidation training — that’s its name. Oh, and next time you have a black Porsche to deliver, could you swing around and pick me up? We could take the long way to its destination. Wink. Sure thang on the Porsche ride! And yes – I do consider this race as pretty good training for the LV 1/2. I’ll make sure and run once or twice between now and mid-November! 26 miles… I could maybe bike that on a good day, but run it? Not in a million years. Nice work! Haha, thanks Brad! I’m definitely feeling the burn today. You should’ve seen me try to go up the stairs to the cafeteria here at work earlier today. I was embarrassed at how much difficulty I was having. Hope you had a great weekend! Whoa there, you must think I’m either crazy or some kind of superhero! Haha. I’m all about taking a trip to Hawaii, but definitely not prepared for any sort of Ironman competition 🙂 Thanks for the vote of confidence, though! I have a friend who just competed in the Ironman World Championships in Hawaii … yesterday or Saturday. That is the pinnacle of all athletic events, in my opinion! Quite a distance to run. Love the restoration on the Ford too! I know, I thought it was pretty cool of my brother to restore that truck. My dad already made a 400-mile drive with it, up to his home in northern Utah, and it made the trip without skipping a beat. If only it got better mpg! Congrats on a another successful marathon completion. Mama Tia needs to whip some more miles out of you. Your Dad’s new ride is pretty sick for only 126,000 miles. Thanks! 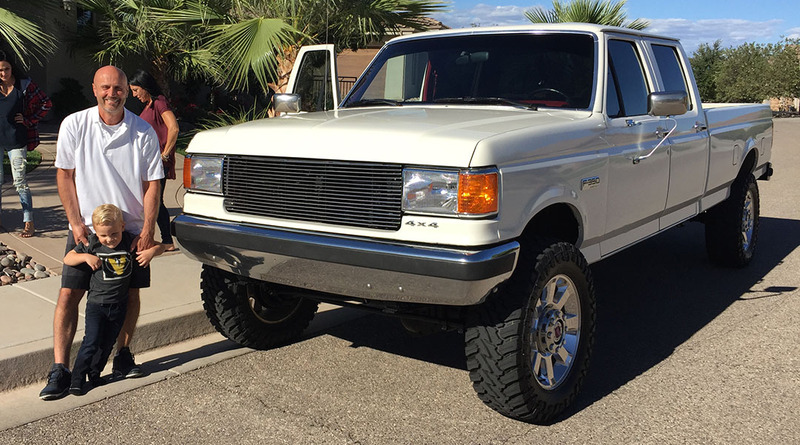 Yeah 126k is nothing for a 25-year-old pickup. When you drive it, you definitely realize how far pickup truck refinement has come. One funny thing — it has power front windows, but manual rolling down rear ones! I remember when the Dodge Neon had power fronts and rolling rears. Crazy. How’d we ever survive? 2.) you get to drive some WAY COOL vehicles! Have a great time at NSXPO! My calves have no definition but THANKS DAVE! It would be sweet to see you again sometime.